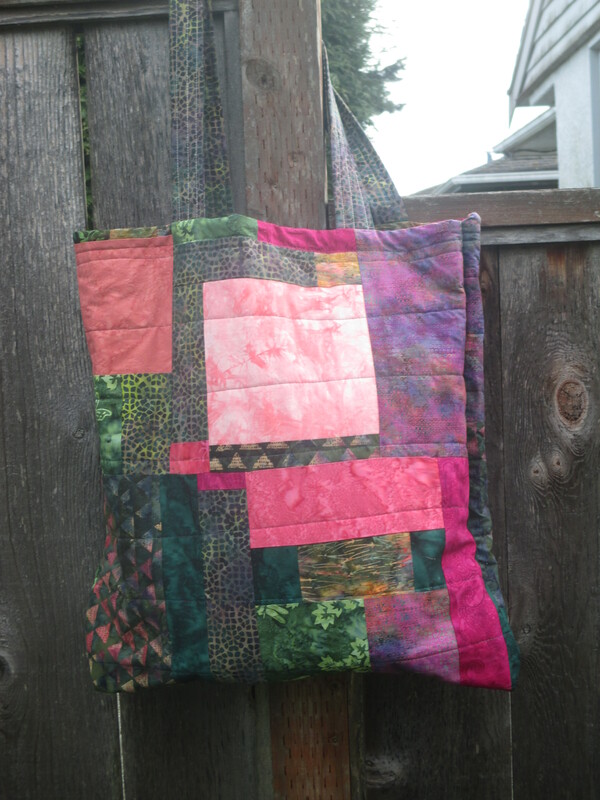 I put this together with leftovers from the quilt itself plus some other batiks and hand dyes. It’s a little smaller than a pillowcase and plenty big enough to take a large nap quilt with room for a book or other small items that might be needed. Now I realize I should have taken a photo of the other side too, oh well. I constructed this by sewing the slab into a long rectangle, folding it in half and sewing up the two side seams. The lizard tote was folded the other way and I had to sew across the bottom and up one side seam. Because this will be a functioning tote as the quilt will be carried around, I took care to keep the lighter colours at the top of the bag as the darker colours can withstand being set down better. The whole tote and the handles are stuffed with batting and quilted with trilobal variegated thread which has a beautiful sheen. Hmm, I could see getting into more totes and the like, there’s something very satisfying about functional objects that you make yourself! I’m still going to do art pieces but sometimes the gap between the inner vision and the ultimate object is so vast.